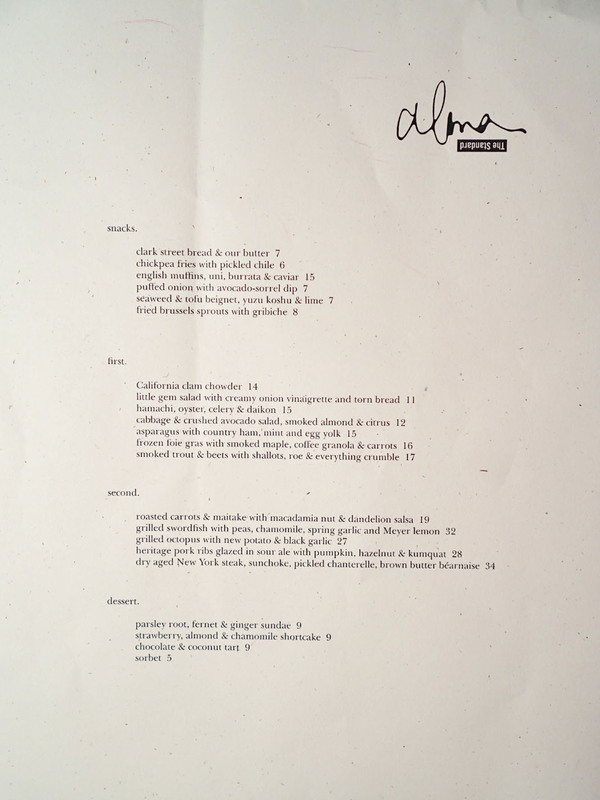 Certainly, one of the most significant restaurant losses of 2015 has to be that of Alma, which shuttered on October 24th. 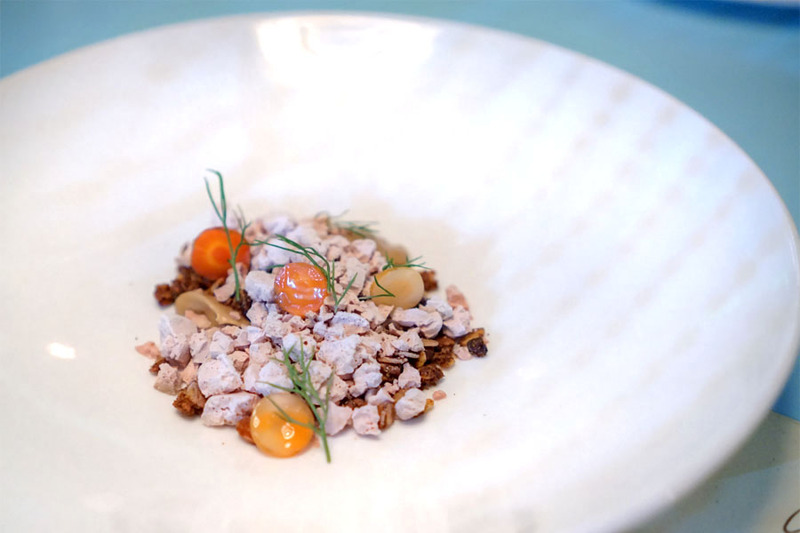 The closure came despite considerable accolades, guest chef dinners (Mads Refslund, Evan Funke), a switch to an à la carte menu, even a successful Indiegogo campaign to defend against that lawsuit from former associate Michael Price. 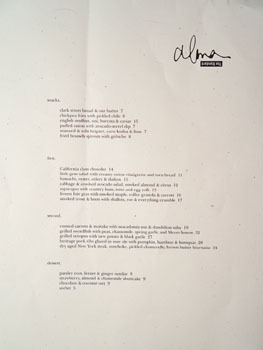 Fortunately for fans of the restaurant, Ari Taymor and Ashleigh Parsons have brought Alma back for a stint at The Standard. The residency began on December 8th, and runs through Memorial Day (after being extended from the end of February). This time around, Chef de Cuisine duties are being handled by Francis Bassa, an alum of Red Medicine and The Bazaar and a former stagiaire at Melisse and Providence who's been at Alma since October 2013. 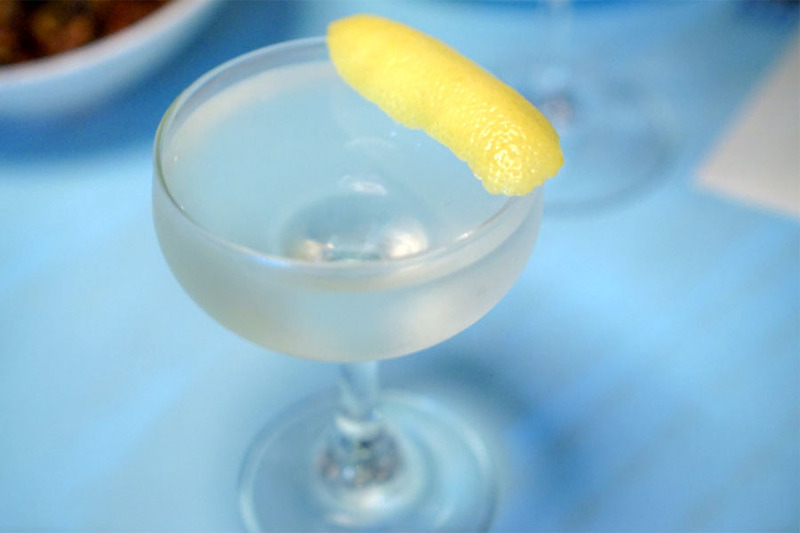 Alma resides in the hotel's 24/7 Restaurant, which has a sort of mod diner type of feel. 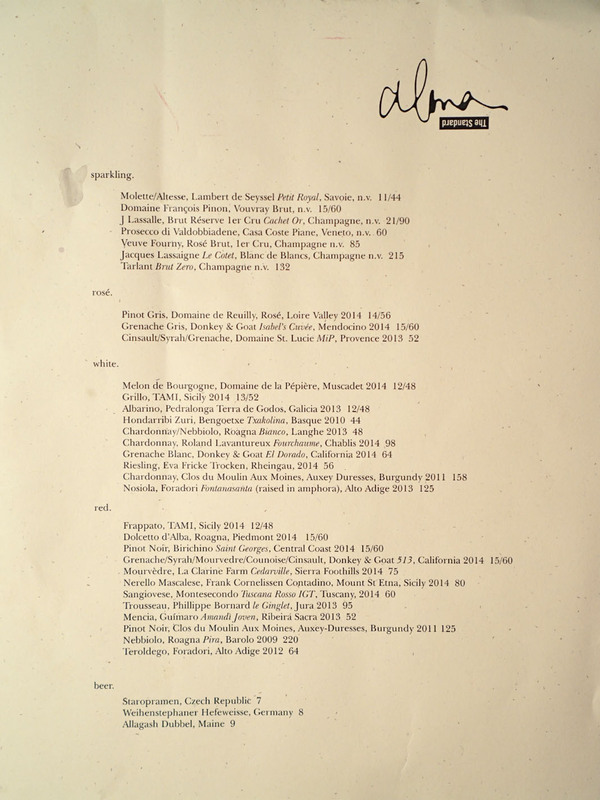 As for the menu, it's an à la carte-only affair, with both old favorites and new creations set in the familiar cadence of snacks/starters/mains/desserts. Beverage-wise, cocktails are now an option, and that compact, mostly Old World wine list remains much as it always has. Click for larger versions. 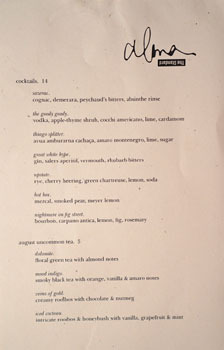 Ostensibly named after Brazilian basketball player Tiago Splitter, our first cocktail featured cachaça, naturally, and had some sour, spicy flavors going on, commingled with the herbal, astringent nature of amaro while lime gave the flavors a lift. 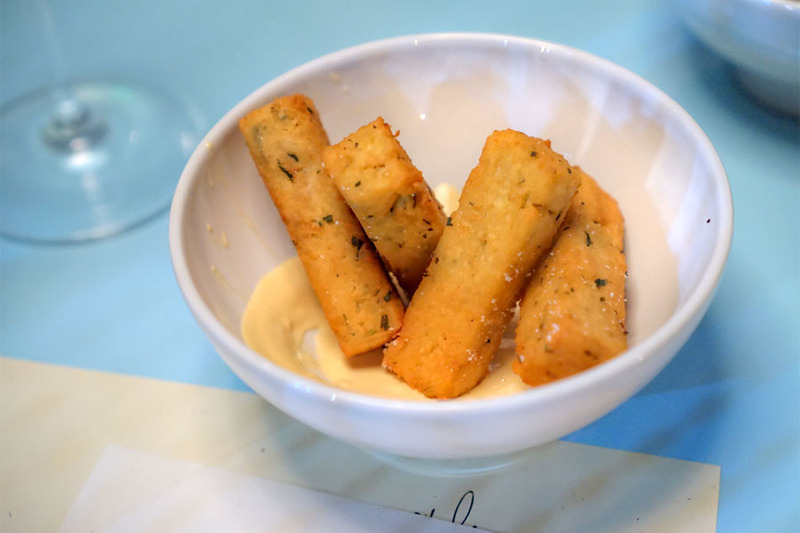 Chickpea arrived in dense, hearty cuboids, their nutty, salty qualities perked up by the zippiness of the accompanying condiment. 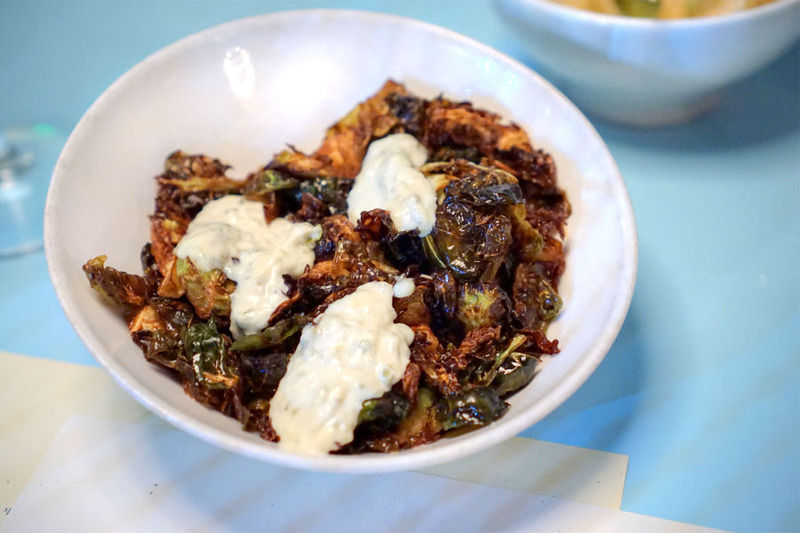 Brussels hit all the familiar notes of char, savor, and astringency, with the gribiche providing an additional creaminess to the mix. I really wanted more satisfying, substantial pieces though. 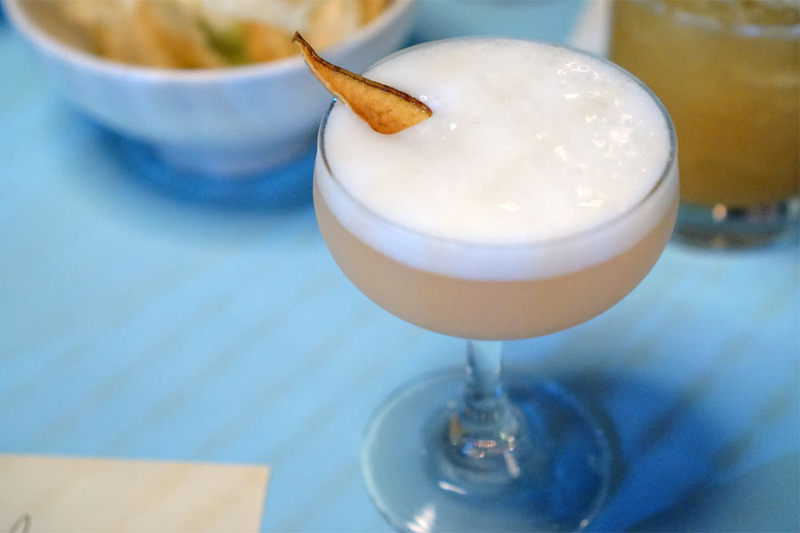 Citrusy to the smell, and tasting of the bitterness of Salers combined with gin botanicals, the drink finishing sweet and candied from the rhubarb. 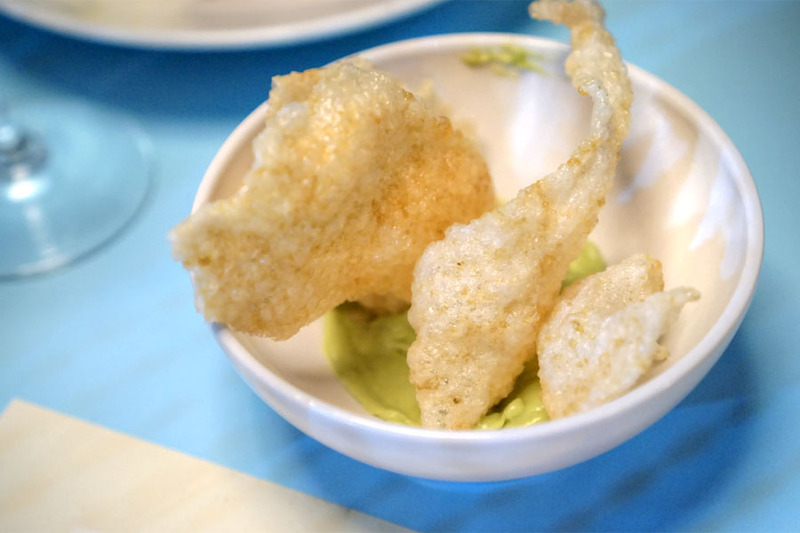 "Chicharrones" came airy and crisp, really conveying the zippy nature of onion against a backdrop of creamy-citrusy guac. A fun one. 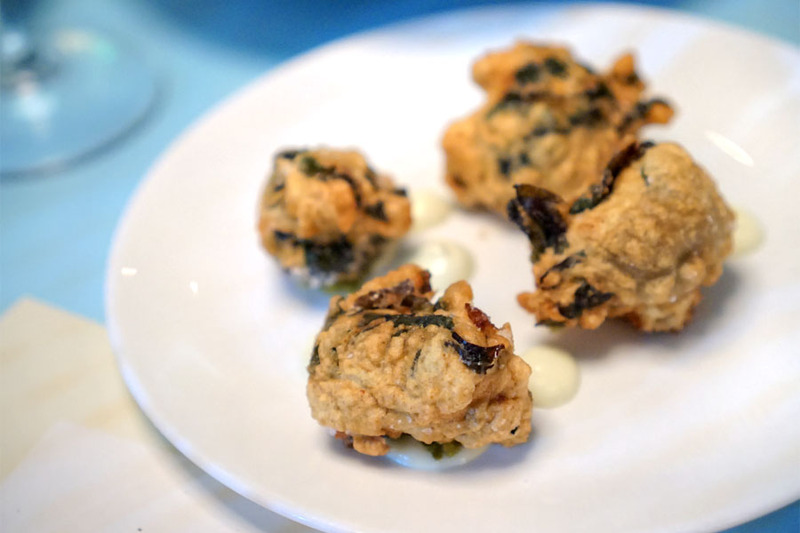 Alma's signature beignets seemed "fluffier" than usual, but still showed off the umami-ness of the seaweed while yuzukosho provided an offsetting piquancy. 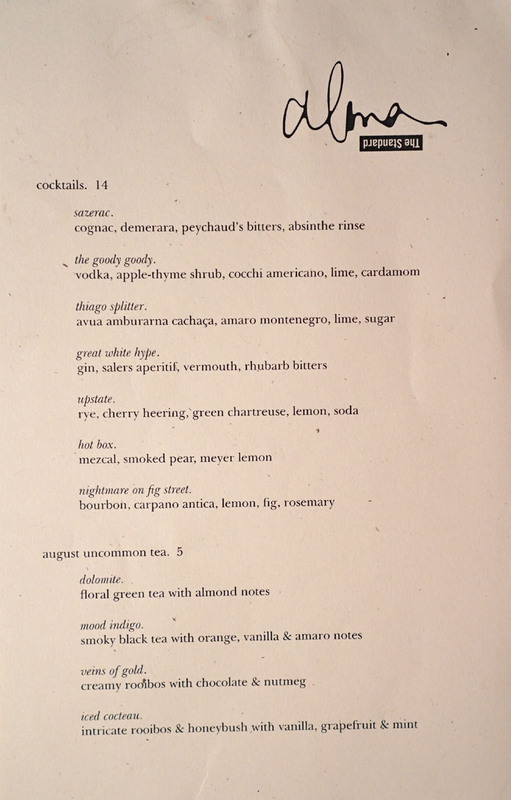 The fig was probably more subdued than I would've liked, though the cocktail still went down easy, with the richness of Carpano matching up well with the aromatics of rosemary. 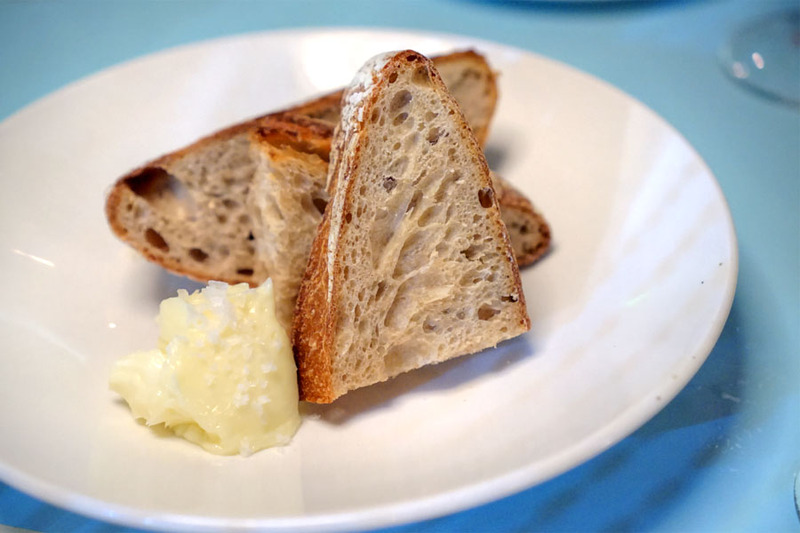 Bread was superb--crisp and nutty in terms of the crust while still supple inside--and matched beautifully with the sweet, salty, uncommonly airy butter. 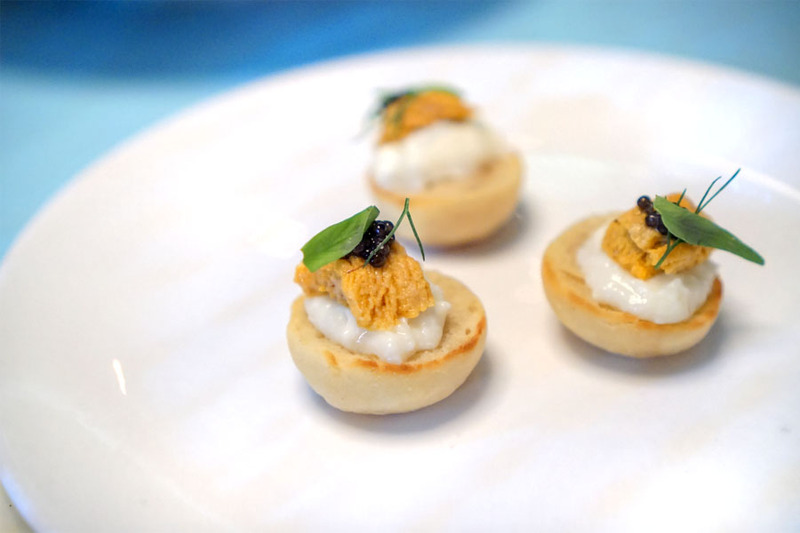 Perhaps Alma's most famous dish by this point, the muffins seemed smaller than I recall, but were spot on taste-wise, the luxuriousness of the uni-burrata combo accented by salty pricks of caviar while the bread served to moderate everything. 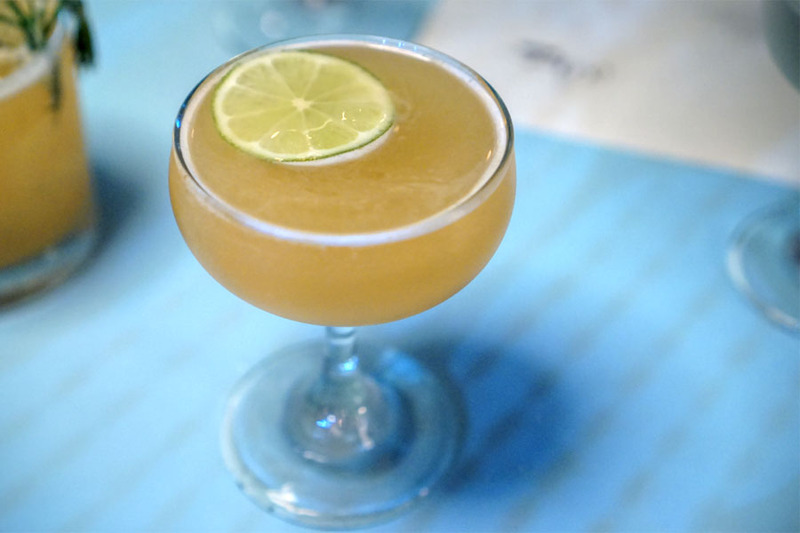 Our final cocktail was my favorite of the four, deftly playing the inherent smokiness of mezcal against the zestiness of lemon. 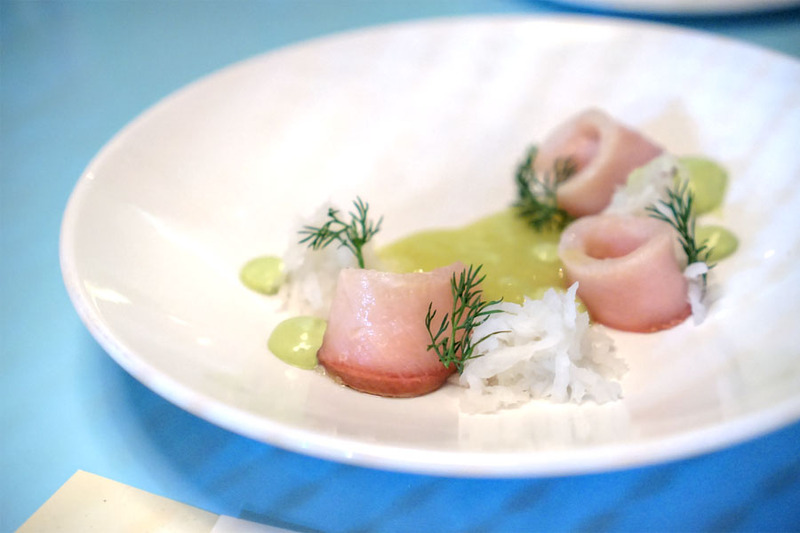 Hamachi came out fatty and briny, a forceful presentation of the fish balanced by the brightness and crunch from the celery and daikon. Another signature dish at Alma, the frozen liver was better than ever, the delicate-yet-potent flavors of the foie perfectly paired with a bevy of nutty, smoky, bitter elements while a sweetness underpinned the dish. Excellent temperature contrast and textures, too. 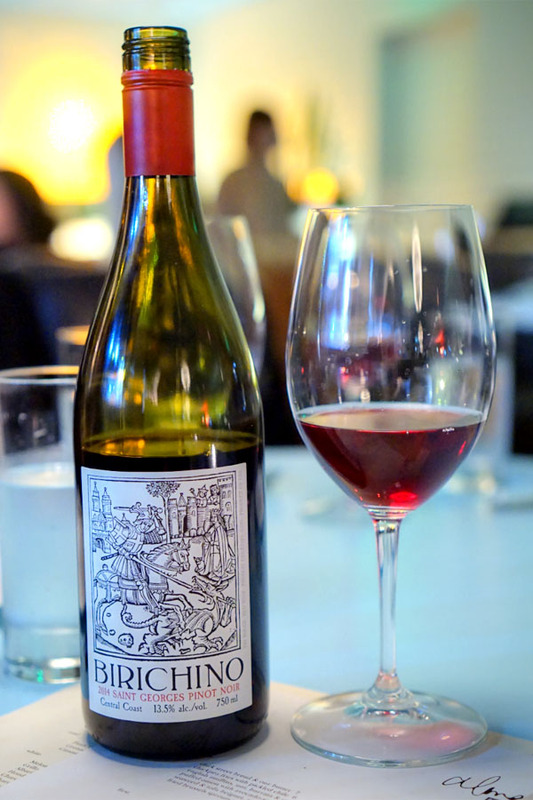 Along with the cocktails, we also had some wine, the Pinot Noir, Birichino Saint Georges, Central Coast 2014 [$60]. I found earthy forest floor combined with berry on the nose, while the taste brought more light, juicy fruit with some spice and palpable tannins. 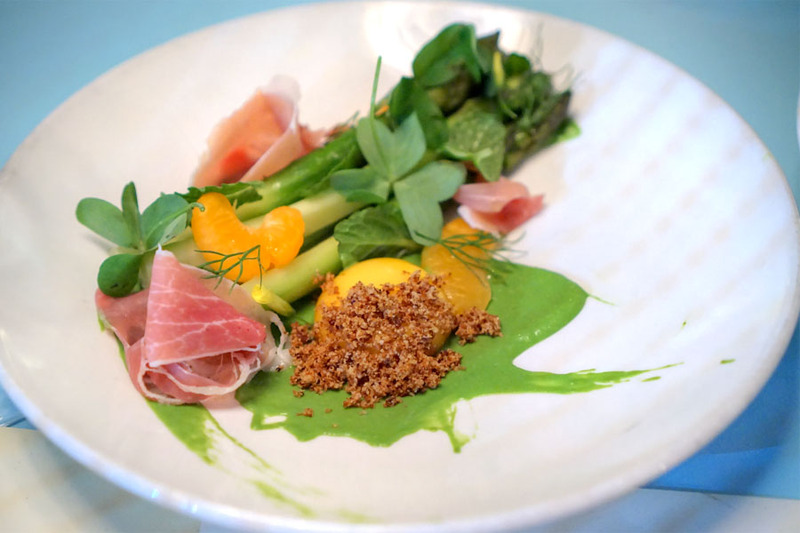 Asparagus spears came bitter and crunchy, the ham imparting a nice bit of saltiness to the mix and the egg an enveloping lushness. 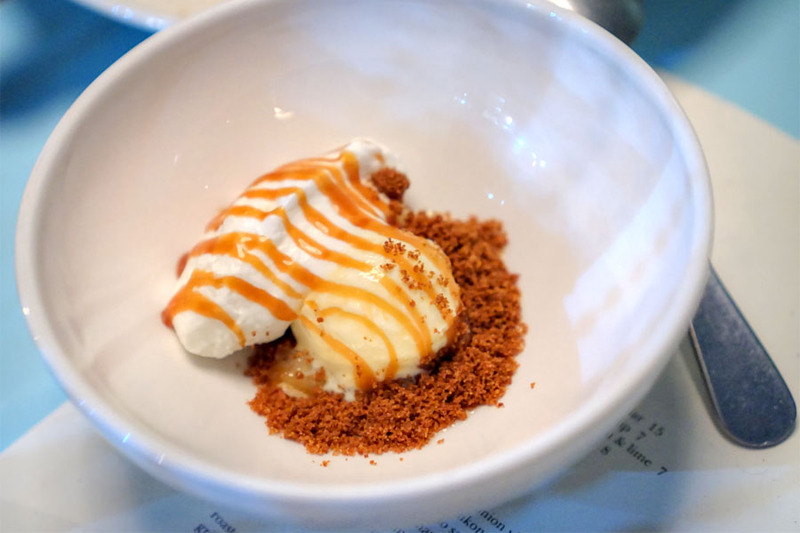 The key for me, though, were the minty notes on the finish, and how that lifted the entire dish. 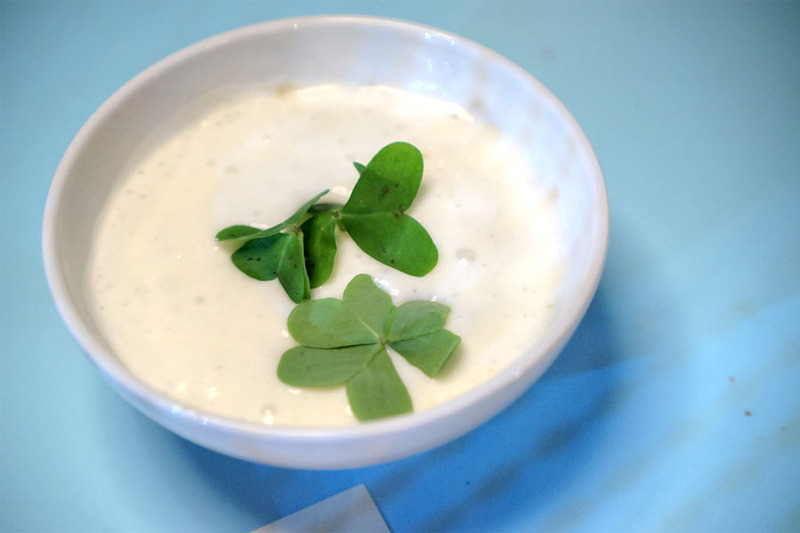 The chowder was another standout, simultaneously cozy yet somehow light in body, with the oceany essence of clams beautifully matched with the tart greenery up top (wood sorrel?). 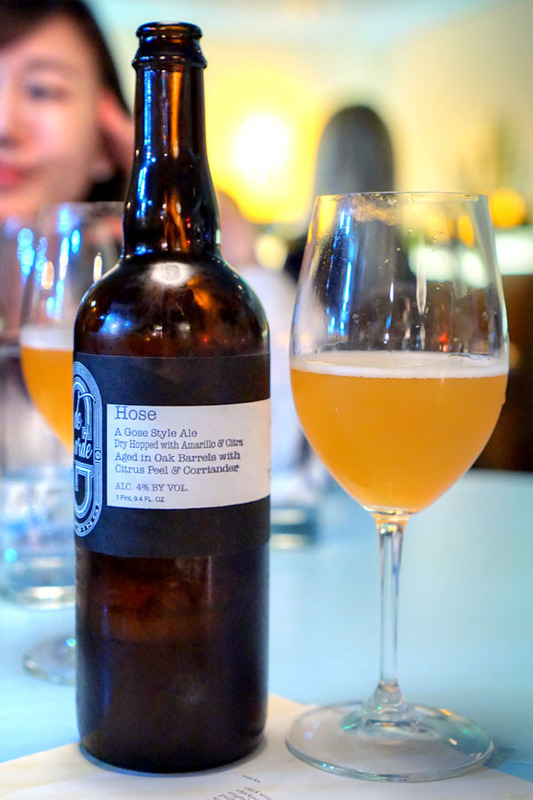 I'd brought along three beers as well (corkage was waived--we made to share with the staff), and we started with the 2015 de Garde Hose, a gose-style ale aged in oak barrels with citrus peel and coriander, then dry-hopped with Amarillo and Citra. This may have been the best gose I've had, certainly the most multifaceted. Think super hoppy, juicy, aromatic to the smell, with a palate that was funky and tart at its core, but with citrus and spice and a subtle saltiness peeking through. 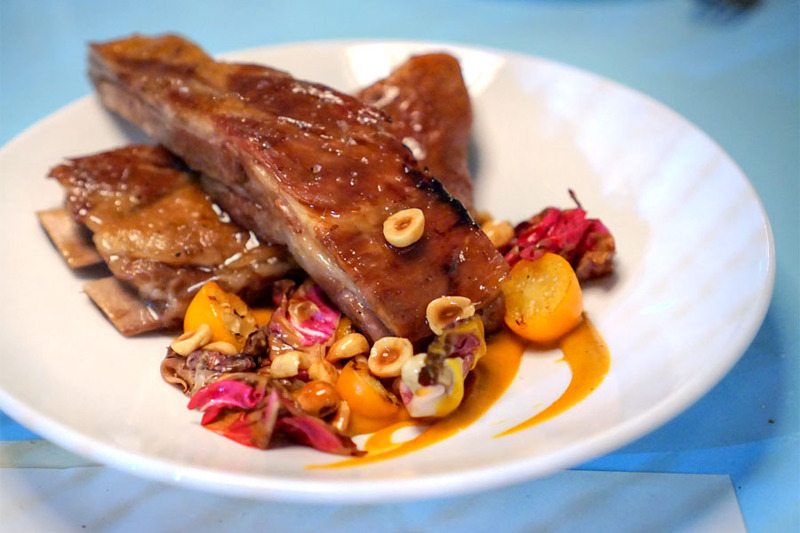 Our most substantial course this evening, pork ribs were supple and fatty, tearing cleanly off the bone, and were imbued with a sweet, sticky savor offset by a smidge of char. 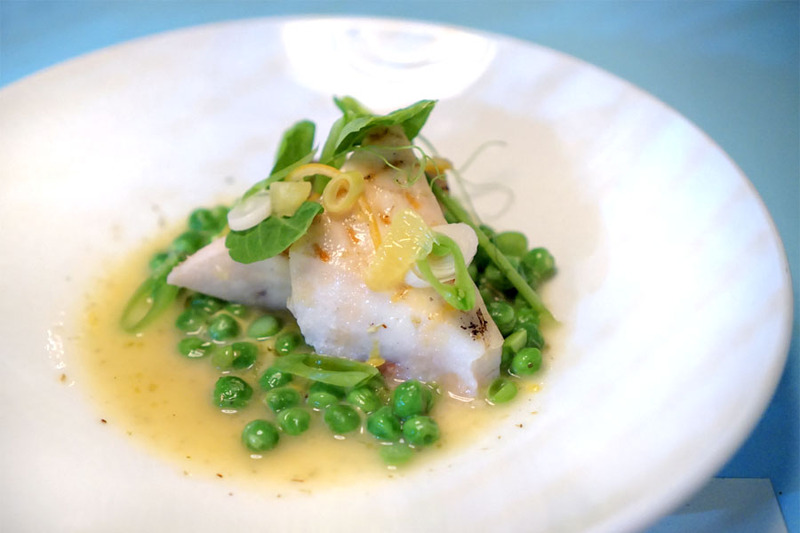 Firm to the bite and loaded with plenty of brine, the swordfish worked as a base on which both buttery and bright nuances from the peas could shine. Another favorite of mine. 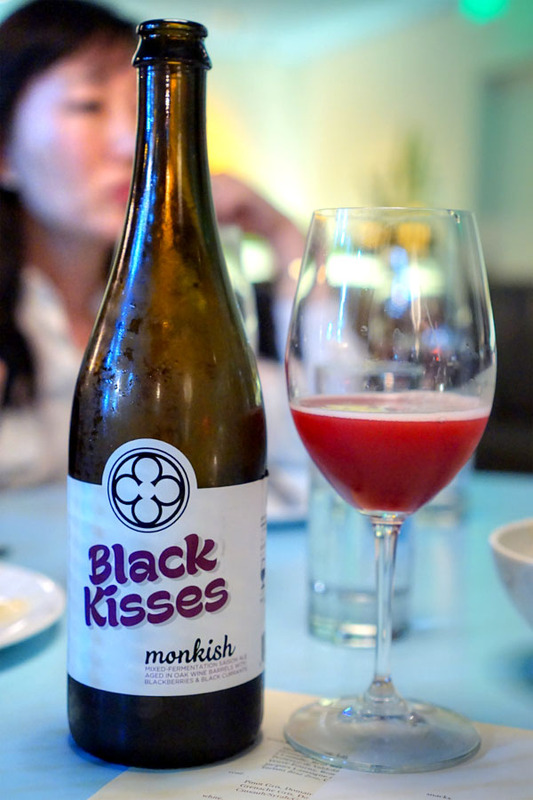 A follow-up to their game-changing Juteux, the 2015 Monkish Black Kisses was a mixed-fermentation saison aged in French oak wine barrels with blackberries and black currants. I found this tart and super jammy on the nose, while the palate was all about tartness, earthiness, funk, with a bit of herbiniess and the fruit in the background. 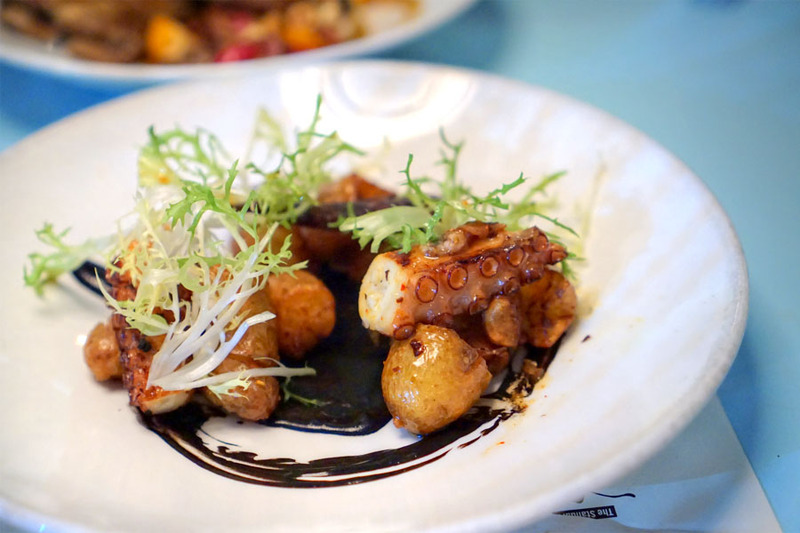 Our final savory, octopus was super tender, with a lovely char and soft salinity augmented by the intensity of black garlic. Hearty bits of potato, though, did help even things out. Time for dessert. 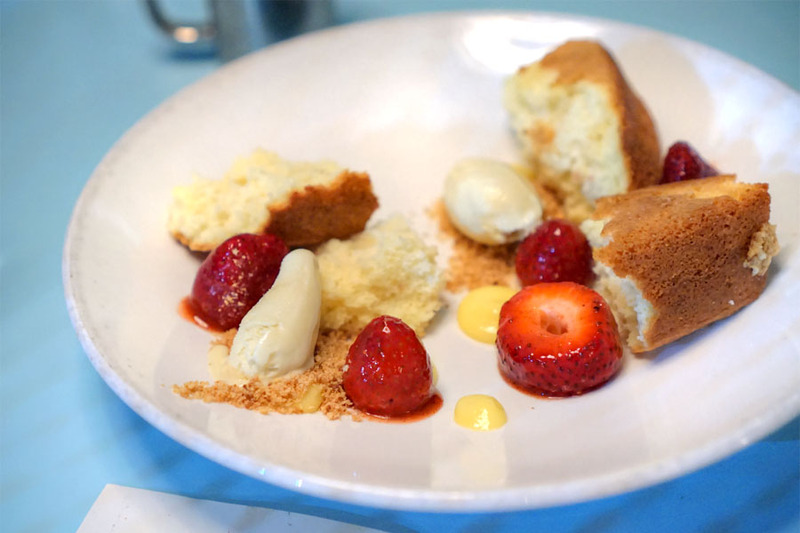 In our first, strawberry was on vibrant display, it sweetness flawlessly matched to the nutty, airy cake. An easy one to enjoy. Parsley root actually made for a smart, satisfying sundae, its restrained, somewhat vegetal sweetness complemented by the bitterness of Fernet and traces of ginger on the finish. 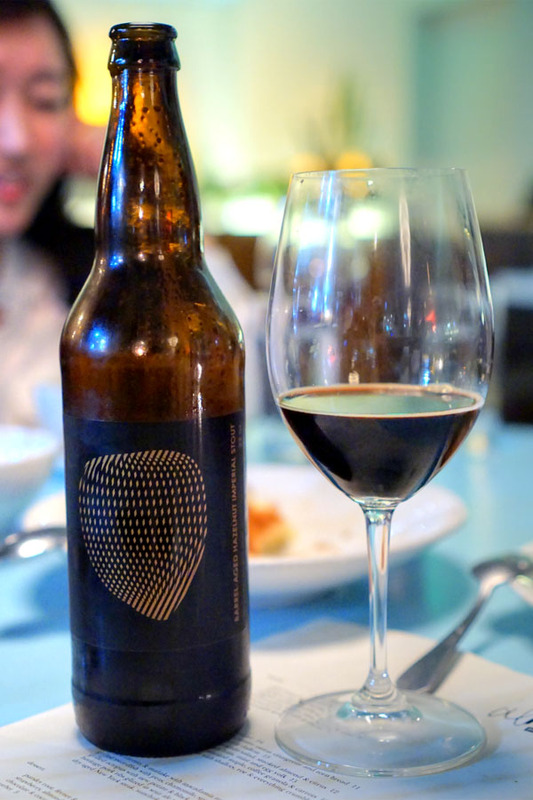 Dessert beer duties were handled by the 2015 Cycle Barrel Aged Hazelnut Imperial Stout, which actually featured cacao nibs in addition to the advertised hazelnut. It was delicious, of course, positively teeming with nutty, chocolatey notes alongside roast and coffee flavors: liquid Ferrero Rocher. 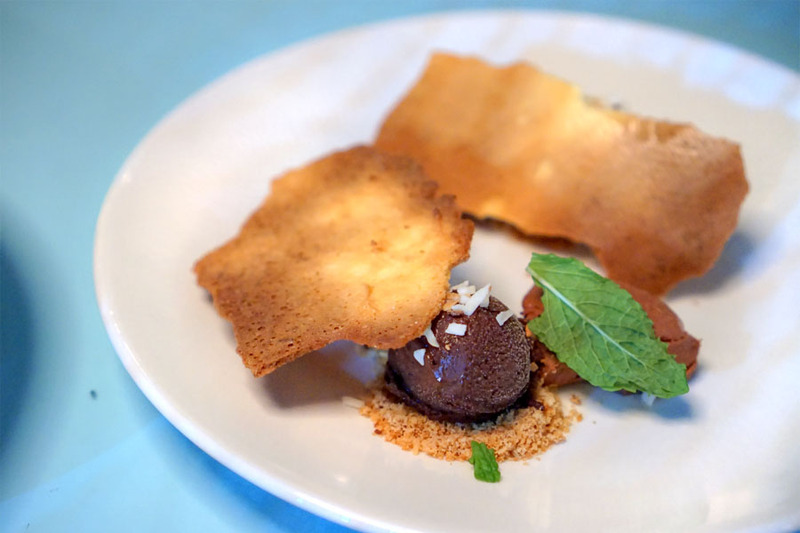 Chocolate was dense and dark, accompanied by comparatively light notes of coconut while the mint imparted a refreshing lightness to everything. Nice textures to boot. 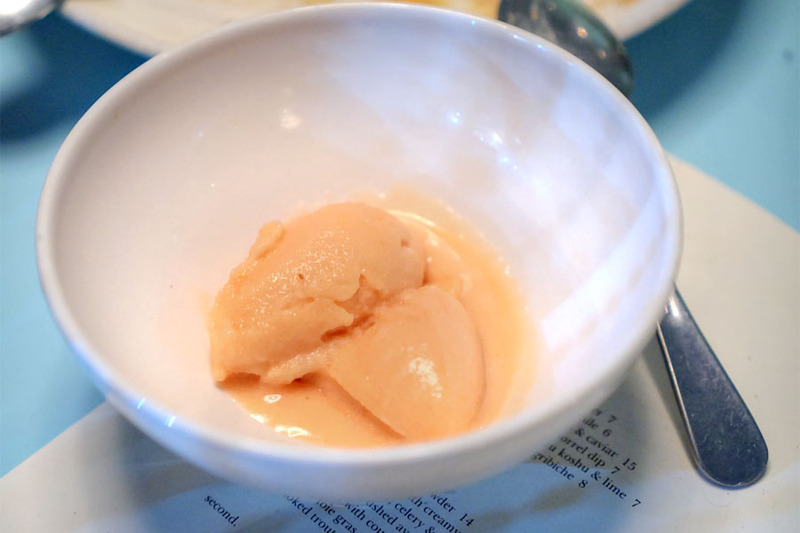 Tonight's sorbet was of the grapefruit-basil variety, and really highlighted the bittersweetness of the fruit. In fact, one of my dining companions recalled Campari. As someone who's visited Alma throughout its entire lifecycle, I was glad to taste the latest iteration of the restaurant. 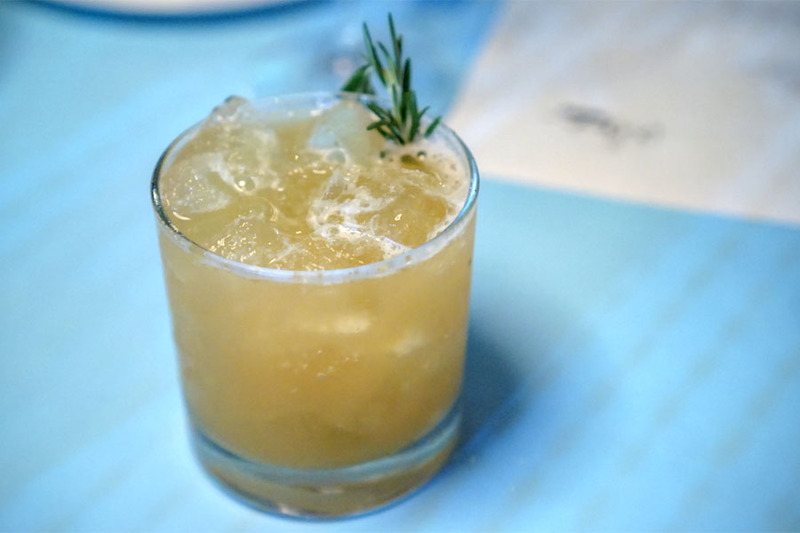 The vibe at The Standard's definitely more casual, and that translates into the food, which seems more at ease, more comfortable, more lighthearted. It's a nice change of pace for Taymor and the team. I'm curious to see where they go from here, since the residency's slated to come to a close soon. I've enjoyed your reports for years and always anticipate the next one. Your attempt to enlighten viewers with razzle dazzle about the Pinot Noir is simply overconcocted, far reaching and beneath you. Relax and keep it simple.